ALK Rearrangement ALK-Positive Lung Cancer ALK Rearrangements and Cancer Clarifying Mutations Diagnosis Who Is Likely to Have It? Who Should be Tested? ALK positive lung cancers, or lung cancers that harbor a gene rearrangement referred to as the EML4-ALK fusion gene, compose a subset of tumors for which medical treatment has expanded rapidly (along with survival) in the past few years. 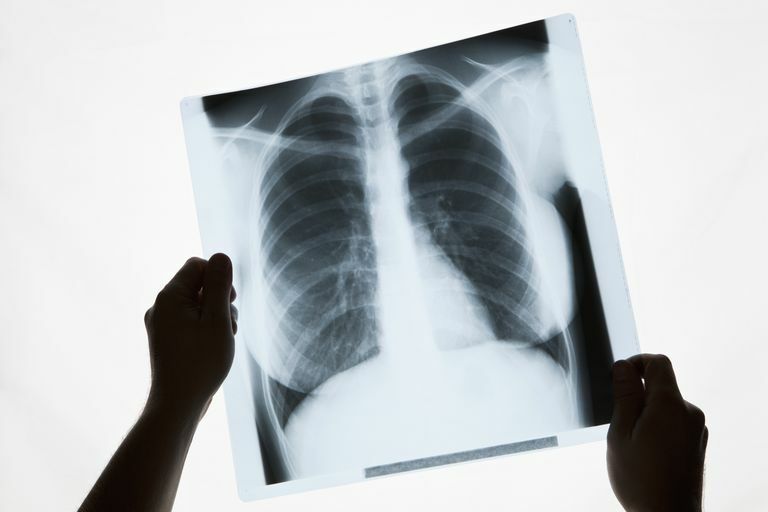 While the overall 5- year survival rate for lung cancer is around 17 percent, which drops to two to four percent with stage 4 disease, a study published in December of 2018 found that the median survival for people with stage 4 ALK positive lung cancer was 6.8 years with the right care. This survival rate held true even for those whose lung cancer had spread to their brain (brain metastases). Let's look at exactly what is meant by ALK positive lung cancer, the history of this subtype, the treatments available, and much more. An ALK rearrangement is an abnormality in a gene that can occur in cancer cells such as lung cancer cells. As a quick review, genes are the parts of chromosomes in our DNA that code for things such as our eye color and hair color. They are also the blueprint that codes for proteins that run the processes that keep our bodies running smoothly—or cause cells to divide and grow. Cancer cells are cells that have undergone several gene mutations—changes in genes—in the process of becoming cancer cells. Like humans, every cancer is different and carries different mutations and genetic changes. These mutated genes in turn code for proteins that are abnormal and perform abnormal functions—such as driving the growth of a cancer. The exciting part of this discovery is that now some cancers can be treated with tyrosine kinase inhibitors, drugs that block tyrosine kinase (in this case the fusion protein EML4-ALK) and inhibit the growth of the cancer by blocking the signals that tell the cell to divide. By essentially controlling the cancer's “on-off” switch, these medications have improved the lives of some people living with cancer who have ALK mutations. Some people are familiar with another mutation found in some people with non-small cell lung cancer, called an EGFR mutation. This mutation also results in the formation of abnormal tyrosine kinase proteins, and the EGFR tyrosine kinase inhibitor Tarceva (erlotinib) has extended the life of many people with lung cancer who have a tumor positive for this mutation. ALK positive lung cancer refers to people who have a lung cancer that tests positive for an ALK mutation (the EML4-ALK fusion gene.) This mutation is present in three to five percent of people with non-small cell lung cancer. That may sound like a small number at first glance, but considering the large number of people diagnosed with lung cancer each year in the U.S. (estimated to be over 200,000 in 2017), that number is actually quite large. Are ALK Rearrangements Seen Only in Lung Cancer? This EML4-ALK fusion gene is also found in some people with neuroblastoma and anaplastic large cell lymphoma. A confusing and important point to note is that the EML4-ALK fusion gene isn’t a hereditary mutation like the BRCA1 and BRCA2 mutations in some people with breast cancer (and some other cancers.) People who have a lung cancer positive for the EML4-ALK fusion gene weren’t born with cells that had this mutation and didn’t inherit a tendency to have this mutation from their parents. Instead, this is an acquired mutation that develops in some cancer cells as a part of cancer development. Bloodwork: A test called CEA (carcinoembryonic antigen) tends to be negative in people with ALK mutations. Radiology: In one study, tumors positive for ALK appeared solid and did not have something called ground glass appearance. In contrast, 50 percent of those without the mutation had radiology studies with a ground glass appearance. At this time, however, molecular profiling (genetic testing) remains the best test and is the standard of care. Who is Likely to Have an ALK Mutation? The types of mutations present in lung cancers vary depending upon the type of lung cancer. EML4-ALK fusion genes are by far most common in people with the type of non-small cell lung cancer called lung adenocarcinoma. That said, in rare cases, ALK has been found in people with squamous cell carcinoma of the lungs (another type of non-small cell lung cancer) and small cell lung cancer. Who Should be Tested for an ALK Mutation (Rearrangement)? Several organizations have worked together to develop guidelines on who should be tested for an ALK mutation. The consensus was that all patients with advanced-stage adenocarcinoma should be tested for both ALK and EGFR mutations, regardless of gender, smoking history, other risk factors, and race. One limitation is that some tumors have areas that appear to be different types of lung cancer. For example, the tissue in one part of a biopsy may look like adenocarcinoma and the tissue in another part of the biopsy sample may look like small cell lung cancer. There are some exceptions physicians may make to these guidelines. For example, testing may be recommended for someone who has never smoked, even though their type of lung cancer does not appear to be adenocarcinoma. These guidelines will likely change as more is learned about these mutations, and other mutations are discovered and subsequent treatments developed. How is ALK Positive Lung Cancer Treated? Even though ALK rearrangements in lung cancer were just discovered in 2007, a treatment (now four) for people who have this mutation (and also have metastatic lung cancer) has already been approved by the FDA. This FDA approval – just 4 years after the discovery of the rearrangement – is exciting amidst a background of lung cancer treatments that haven’t increased survival significantly in the last several decades. The medication Xalkori (crizotinib) is an inhibitor of tyrosine kinase. In this case, Xalkori binds to the tyrosine kinase receptor on the surface of lung cancer cells and inhibits the abnormal ALK protein. An easier way to understand this is to think of the tyrosine kinase receptor as a lock, and the tyrosine kinase protein (made by the abnormal gene) as a key. People with an ALK mutation have an abnormal key. When the key is “inserted,” signals are sent to the growth center to have cells divide without stopping. Medications such as Xalkori work by blocking the keyhole – sort of like if you filled the keyhole on your front door with concrete. Since the key (the abnormal protein) is unable to enter the lock (bind with the receptor,) the signal for the cell to divide and grow never reaches the control station and cell division (growth of the tumor) is halted. Studies have found that treatment with Xalkori results in a median progression-free survival of 7 to 10 months. There is roughly a 50 to 60% response rate to the drug. This may not seem dramatic, especially when compared to treatments for some other cancers, but it's noteworthy that the people in these studies had already received and failed previous chemotherapy and the expected response rate to further traditional chemotherapy would only be around 10% with an average progression-free survival of around 3 months. Even though the response rate with Xalkori is better than with standard chemotherapy, studies haven’t found that Xalkori increases overall survival. Yet while survival is important, quality of life is also important. Delaying the progression of cancer likely reduces symptoms related to the cancer, and in fact, patients treated with Xalkori had fewer symptoms related to their lung cancer (less shortness of breath, chest pain, and fatigue.) It’s also uncertain whether this study accurately assessed survival rate since people in this study were allowed to “cross-over” and use the other treatment if their symptoms progressed. More people stopped chemotherapy and switched to crizotinib than the other way around. In addition, a new drug to address ALK-positive lung cancer, Alunbrig (brigatnib) was approved April 28, 2017. In November of 2018 the drug Lobrena (loratinib) was approved for people previously treated with other ALK inhibitors, and was found to be effective in roughly half of people who had become resistant to other drugs in this class. The median duration of action was 12.5 months. At the current time, it's thought that alectinib offers longer progression-free survival than crizotinib (25.7 months vs 10.4 months) and has fewer side effects, so may be the better choice first line. In addition, a 2018 study published in The New England Journal of Medicine found that brigatinib was superior to crizotinib first line. In this study, 71 percent of people responded to brigatinib vs. 61 with crizotinib, and brigatinib was associated with a 51 percent lower risk of progression and death. That said, it's important to talk to your oncologist about which of these drugs is likely to work best for you. It’s important to keep in mind that tyrosine kinase inhibitors are not a cure for lung cancer, but rather something that allows a tumor to be “kept in check” much as a medication for diabetes may control the disease but does not cure it. It is hoped that in the future, lung cancer, at least certain types with certain mutations, may be treated like other chronic diseases such as diabetes. Unfortunately, even though over half of people respond well to treatment, resistance almost always develops over time and the drug loses effectiveness. For people who develop resistance, there are still options available. Alectinib was granted breakthrough designation in 2013 for people with ALK-positive lung cancer resistant to crizotinib. In March of 2014 another medication - Zykadia (ceritinib) - was granted breakthrough treatment by the FDA. Initial response rates to Zykadia were similar to those with Xalkori. In addition - many people who had developed resistance to Xalkori responded to Zykada. Lorbrena was approved in November of 2018 for those who developed resistance to the other medications in this class. New medications are being studied in clinical trials for people who develop resistance, and some researchers hope that in the future patients may be treated in a sequential fashion with these drugs as resistance develops. In addition, tumors often change (develop new mutations) over time. Sometimes a medication that targets another treatable mutation (such as EGFR) may work even though a tumor was not initially positive for an EGFR mutation. It is hoped that in the near future we will be able to treat lung cancer—at least this subtype—in much the same way we treat other chronic diseases. Clinical trials are currently in progress trying to learn more about which of the four medications now available works best. There is some evidence that newer drugs (both with ALK rearrangements and with other mutations) may be able to better treat metastases to the brain. Due to the presence of the blood-brain barrier, a series of tightly woven capillaries that prevents many toxins (including chemotherapy and targeted therapies) from entering the brain, many of the drugs we currently have available to treat lung cancer are not effective against brain metastases. For those with only a few brain metastases, stereotactic brain radiotherapy (SBRT) or cyber knife has offered an option to treat these, yet ideally, in the future, we will have medications which can address these better as well. We always caution people about taking any supplements while in cancer treatment without first talking to their oncologist, and this is important with crizotinib (and possibly the other targeted therapies). In 2018 it was found that a component of vitamin E called a-tocopherol could significantly interfere with crizotinib treatment. Vitamin E (or at least this component) both attenuated the activity of crizotinib, and also inhibited cancer cell death due to crizotinib. The appeared to only be true for a-tocopherol, and not other vitamin E component such as y-tocopherol. That said, many vitamin E supplements and other vitamin supplements which contain vitamin E often have a-tocopherol as a leading ingredient. As with so many treatments for cancer, medications such as Xalkori have side effects. Thankfully many of these are much milder than what people experience during traditional chemotherapy. The most common symptoms people experience on Xalkori include visual problems, diarrhea, nausea, shortness of breath, and abnormal liver function tests. A rare but severe side effect that has been noted is the development of interstitial lung disease which can be fatal. Side effects with brigatinib are of slightly greater concern than those with crizotinib, and include elevations in muscle and pancreatic enzymes (but no increased incidence of muscle pain). In order for medications to be used that target mutations such as ALK, people with lung cancer must be tested for the mutation. While guidelines recommend testing for everyone with advanced adenocarcinoma and the use of this technology is increasing, there are still many people who are never offered the test. There are a few reasons for this. One is that this is a very rapidly changing area of medicine, and no doctor can be on top of every new finding. Ask questions. Do a little research (or have a friend or loved one research your tumor.) Consider getting a second opinion at a cancer center that sees a large volume of lung cancer patients. Another concern is the cost. The newer medications that target abnormalities in cancer cells often come with a steep price tag. But there are options available. For those who don’t have insurance, there are government as well as private programs that can help. For those with insurance, copay assistance programs may help defray costs. In some cases, the manufacturer of the drug may be able to supply medications at a reduced cost. And importantly, as a participant in a clinical trial, medications, as well as office visits, are often provided free of cost. As a final note, no matter how much you learn from your medical team, there is nothing like hearing from people who have actually been there and received the treatments you are likely to receive. Check out support groups for people with lung cancer and ask if anyone else has an ALK mutation. Some organizations such as LUNGevity have a matching service (the LUNGevity LifeLine) in which they can even match you with someone with lung cancer who has a similar type and stage of the tumor. Bang, Y. Treatment of ALK-Positive Non-Small Cell Lung Cancer. Archives of Pathology and Laboratory Medicine. 2012. 136(10):1201-4. Calio, A. et al. ALK/EML4 Fusion Gene May Be Found in Pure Squamous Carcinoma of the Lung. Journal of Thoracic Oncology. 2014. 9(5):729-32. Doebele, R. et al. Mechanisms of resistance to crizotinib in patients with ALK gene rearranged non-small cell lung cancer. Clinical Cancer Research. 2012. 18(5):1472-82. Dacic, S. Molecular genetic testing for lung adenocarcinomas: a practical approach to clinically relevant mutations and translocations. Journal of Clinical Pathology. 2013 Jun 25. (Epub ahead of print). Forde, P., and C. Rudin. Crizotinib in the treatment of non-small-cell lung cancer. Expert Opinion in Pharmacotherapy. 2012. 13(8):1195-201. Garber, K. ALK, Lung Cancer, and Personalized Therapy: Portent of the Future?. Journal of the National Cancer Institute. 2010. 102(10):672-675. Katayama, R. et al. Mechanisms of acquired crizotinib resistance in ALK-rearranged lung cancers. Science Translational Medicine. 2012. 4(12):120ra17. Katayama, R. et al. Two Novel ALK Mutations Mediate Acquired Resistance to the Next-Generation ALK Inhibitor Alectinib. Clinical Cancer Research. Pubished OnlineFirst September 16, 2014. Kim, S. et al. Heterogeneity of genetic changes associated with acquired crizotinib resistance in ALK-rearranged lung cancer. Journal of Thoracic Oncology. 2013. 8(4):415-22. Lindeman, N. et al. Molecular Testing Guideline for Selection of Lung Cancer Patients for EGFR and ALK Tyrosine Kinase Inhibitors: Guideline from the College of American Pathologists, International Association for the Study of Lung Cancer, and Association of Molecular Pathology. Journal of Molecular Diagnostics. 2013. 15(4):415-53. Nagashima, O. et al. High prevalence of gene abnormalities in young patients with lung cancer. Journal of Thoracic Disease. 2013. 5(1):27-30. Ou, S. et al. Crizotinib for the treatment of ALK-rearranged non-small cell lung cancer: a success story to usher in the second decade of molecular targeted therapy in oncology. Oncologist. 2012. 17(11):1351-75. Pluzanski, A., Piorek, A., and M. Krzakowski. Crizitinib in the treatment of non-small-cell lung carcinoma. Contemporary Oncology (Pozn). 2012. 16(6):480-484. Ren, S. et al. Analysis of driver mutations in female non-smoker Asian patients with pulmonary adenocarcinoma. Cell Biochemistry and Biophysiology. 2012. 64(2):155-60. Shaw, A. et al. Crizotinib versus Chemotherapy in Advanced ALK-Positive Lung Cancer. The New England Journal of Medicine. 2013. 368:2385-2394. Uchihara, Y., Kidokoro, T., Tago, K. et al. A Major Component of Vitamin E, a-Tocopherol Inhibits the Anti-Tumor Activity of Crizotinib Against Cells Transformed by EML4-ALK. European Journal of Pharmacology. 2018 Feb 11. (Epub ahead of print). Camidge, R., Kim, H, Ahn, M. et al. Brigatinib versus Crizotinib in ALK-Positive Non–Small-Cell Lung Cancer. The New England Journal of Medicine. 2018. 379:2027-2039. Pacheco, J., Gao, D., Smith, D. et al. Natural History and Factors Associated with Overall Survival in Stage IV ALK Rearranged Non-Small-Cell Lung Cancer. Journal of Thoracic Oncology. 2018. Online publication 30 December 2018.